In newspaper profiles connected with his new book, the legendary 89-year-old oral historian Studs Terkel has marvelled at how easy it was. “They say nobody wants to talk about death. Let me tell ya: everybody wants to talk about it!” What happens when we die? How do we support ourselves in grief? Do we want to be “hooked up” at the end, or not? And the big question, from the traditional hymn: will the circle be unbroken, by and by? Well, the sixty-some interviews in Will the Circle Be Unbroken? certainly attest to a basic impulse to “reflect on death like crazy”. This stuff just bursts out of people — so much so, in fact, that although Terkel sorts their testimonies strictly under headings, the voices somehow all strive to be heard at once — believers and non-believers; old and young; black and white; angry and consoled — until what you hear is a rich (if muddling) human cacophony of faith, uncertainty, grief and redemptive compassion. 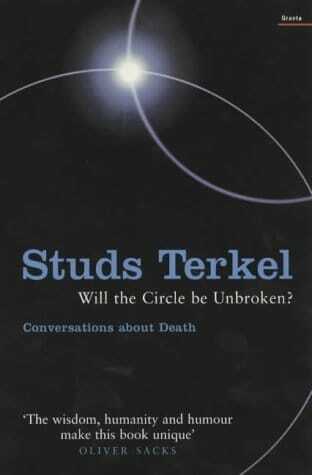 He knows a lot of people, Studs Terkel. Most of them, to judge by this book, are progressive liberal Chicagoans with spotless social consciences who are liable to make the reader feel quite worthless by comparison, frankly. “Who’s next on the list?” I started to wonder, facetiously. “Al Truism? Ben Evolence? Hugh Manity?” Unforgivable, of course, but I was so tired of everyone being a saintly outreach worker or an Aids nurse, or a retired public school teacher. Of course the selection of subjects just reflects the author’s famous encouraging view of bottom-up human kindness, but you can’t help thinking: aren’t people in the wider world today more selfish than this? Don’t they die too? But the cumulative effect is, as Terkel tells us, the revelation of the astonishing prevalent power of death over people alive. In a simple section towards the end of the book, titled “The End and the Beginning”, he gives two contrasting stories with such obvious edifying effect that they might be a sermon. In the first, an old woman remembers the horror of seeing her 14-year-old son’s remains after he’d been hacked to death in a notorious racist attack. Though it happened in 1955, the memory of her son’s state is still so raw and distressing, the import is: this death ended her life. The second story — representing “the beginning” — is of a man whose grandmother’s death inspired him to become a neurosurgeon.